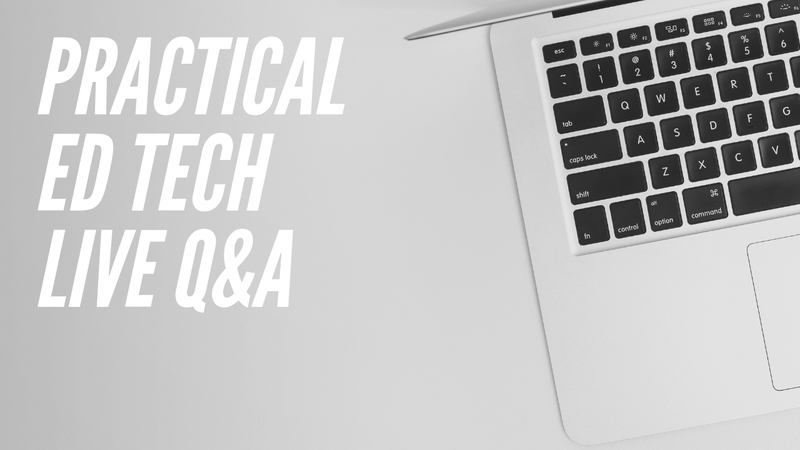 Yesterday afternoon I hosted another edition of Practical Ed Tech Live! I answered a handful of questions from readers during the fourteen minute broadcast. The recording is now available to watch here and as embedded below. The questions that I answered appear below the video. Do you have a suggestion for a way to move my folders from one Google drive to another one? I'm moving and want to take with me my work folders. Thanks! We have students needing to digitally draw for a create-your-own-shoe project in business Ed classes. Will you please recommend a few digital resources they can use? A while back you had posted about how to create flashcards that open up in your browser when you sign on to the Internet. For the life of me I can’t remember if this was an extension or a site. Do you have any idea what I’m talking about? I’d like to share it with a parent whose child is struggling with his math facts. Do you have a recommendation on how to make interactive videos? I looked at YouTube’s editor. It appears that it only works for approved partners. I am looking for some excellent math apps for Grade 1 and 2. Any suggestions that are either free or relatively less expensive? I am also looking so that they can be linked to all the ipads in the classroom without having to buy each app separately. I'm seeing a lot of great things about choice boards, online stations, etc. This is a component I want to implement for next year. However, I would really like to be able to add my voice on a Google Slide/Google Sheet so that students can hear the directions from me. Is this possible on the iPad? How exactly do I do this. I'm seeing a lot of tutorials but nothing is instructing me on how to make this work for students with a 1:1 iPad. How are schools using Google Cardboard? Are they buying ipods or iphones? Is there an affordable option that schools are using? Our district is looking for a way to record test questions & answer choices individually so a student can click on a question and have just that one read to them. I normally read the whole test using Audacity and download one MP3 file but they want smaller chunks. Wizer is too inconsistent. Searched your website and didn't see anything that already existed. Any ideas?